I have been dreaming again about the most amazing run I had over the summer as the weather is getting colder. The in-laws were up from Florida for a visit, and they took our family to the Milwaukee Zoo. We stayed overnight nearby so my MIL could spend some time with her closest friend that lives close by. I, of course, packed my runnin' shoes. Just across the street from the motel was the mouth of a nature path. Around dusk, I laced up and left my two boys to unwind in the room with strict instructions that if I didn't return in 45 minutes to send a search party. I didn't feel like running. True confession: most of the time I don't feel like running. But I know exactly how I'll feel if I do run, so I always do anyway. The air was perfect for a run. The visual relief of nature was delightful. The departure from the norm was fantastic. Just running in a new place has a way of reviving the spirit of fitness inside me. But it got soooo much better. I rounded a bend about halfway through my run when I heard some rustling that made my hair stand up. I saw something moving in the brush. Then, a brown neck popped up and I realized I was within feet of a beautiful doe. Right then, I noticed the second one. Those huge eyes, those beautiful bodies standing dead-still waiting to determine if I was a threat. I just smiled at them knowingly as I padded by, trying to send signals with my eyes that I would never hurt them. Not too far up the path, I reached my halfway point and turned around. Those pretty girls were still there. Those city gals let me get pretty close, so I could snap a shot with my phone as proof. Then, I left them alone again and carried on. Near the end of the run, I saw another flash in the brush. Thinking I'd spied the eyes of a rodent or other little animal, I ran a little faster. 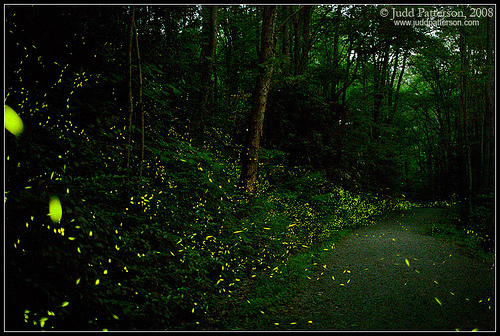 But I noticed another flash and another and another until I realized I was completely surrounded by lightning bugs. It was so magical, almost mystical. I had not seen lightning bugs since I was a kid on a family camping trip. I rode my bike through a small patch of trees and there was a tiny swarm of them. That was another magical moment from another time. I went a little slower for the rest of the run, taking it all in. In fact, I even ran back through one stretch, just so I could run through it again. It was amazing! Back at the motel, I insisted that the boys retrieve their shoes and follow me back down the path. I got to experience my son's first encounter with lightning bugs and it was so surreal and beautiful. Nothing beats a run like that.